Did you miss me? 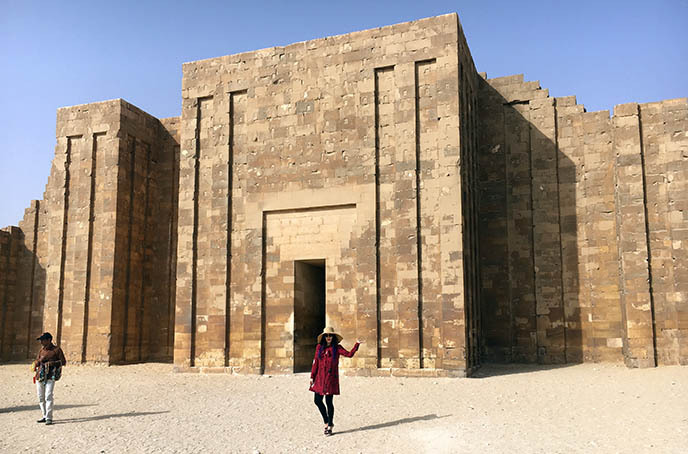 I’m back to blogging, after an unforgettable journey in Egypt with Travel Talk Tours. 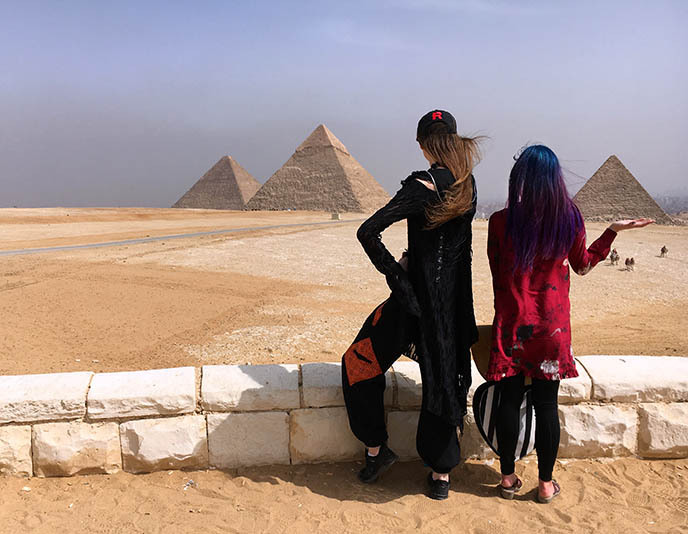 Yukiro and I spent twelve days in Egypt, on a Travel Talk group tour with other young travellers from around the world. 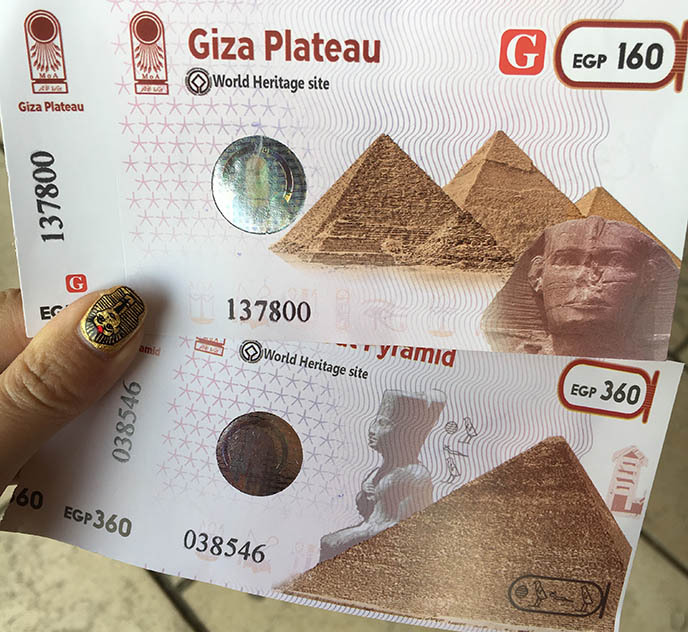 What a moment to finally stand in front of the Pyramids of Giza, one of the Seven World Wonders! 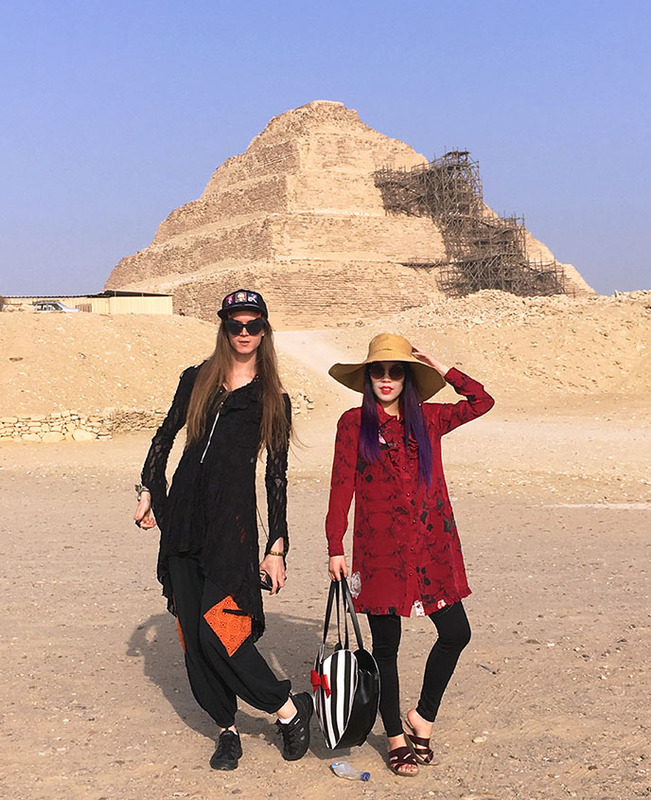 On the first day of the journey, we walked in the footsteps of the ancient Egyptians, and saw magnificent sites like the pyramid of Djoser. 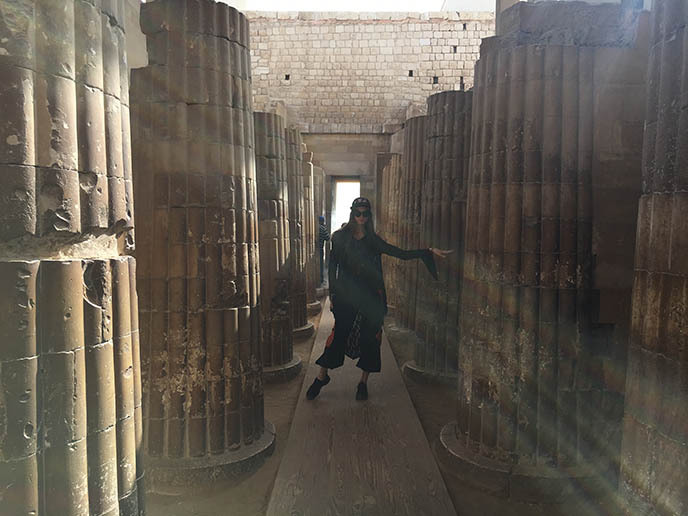 Read on for our “queens of the Nile” adventures in and around Cairo. I wore a red Keipsule dress for the occassion. I’m shading myself from Ra (the sun god) with my Gottex Belladonna hat from UK Swimwear; see more styles below. While Egypt’s tourist areas are safe to visit, this is not the easiest country to navigate. 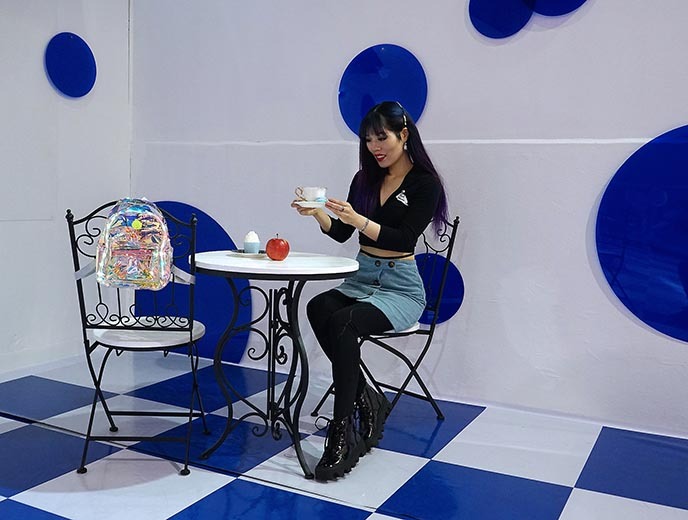 Thankfully, Yukiro and I could lean on Travel Talk Tours, as they took care of every arrangement for us (hotels, transport, activities, restaurants, guiding). 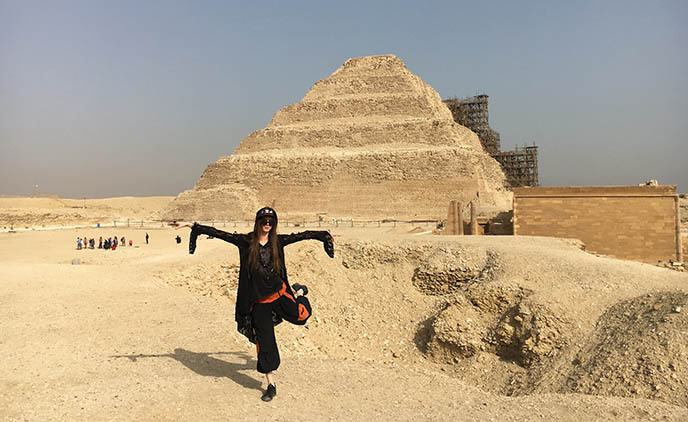 When I arrived at Cairo International Airport, I immediately spotted a team member holding up a “Travel Talk Tours” sign. He helped me buy the visa on arrival ($25 US), and breeze though customs. Then, he drove me to the Oasis Pyramids hotel where everyone was staying. The next day, I filled up on pita, falafel and vegetables for breakfast. 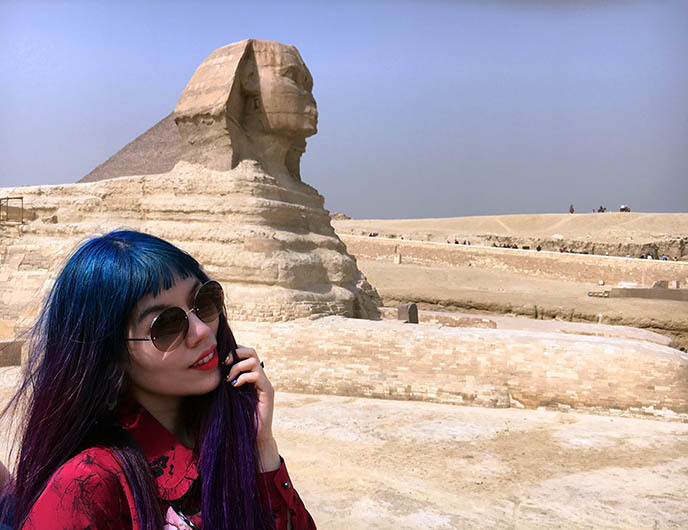 And then, it was off to see the Great Sphinx of Giza! Even if you’ve seen the Sphinx a thousand times in photos and videos, nothing comes close to being here in person. Our guide told us how the statue depicts a mythical creature with a human head (probably the pharoah Khafre) with a lion body. Can you believe this magnificent beast was sculpted during the Old Kingdom, almost 5000 years ago? 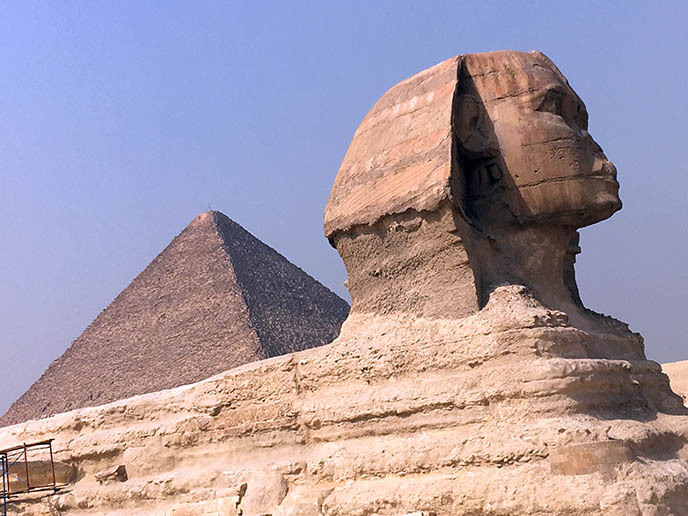 We learned that the Sphinx didn’t actually lose his nose to Napoleon Bonaparte’s cannonballs. 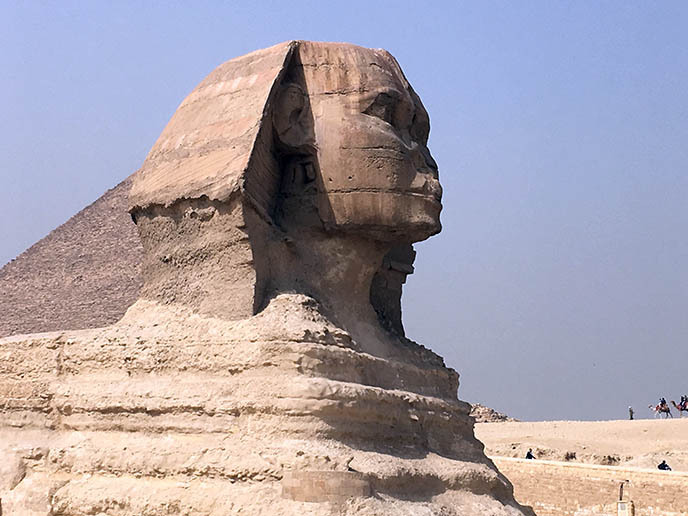 There are many tales of how the nose and beard went missing, but nobody knows the truth… except perhaps the mysterious Sphinx himself. Some of the people in our tour opted to take a camel ride through the Giza plateau. Everyone else went to this viewpoint of all three pyramids. 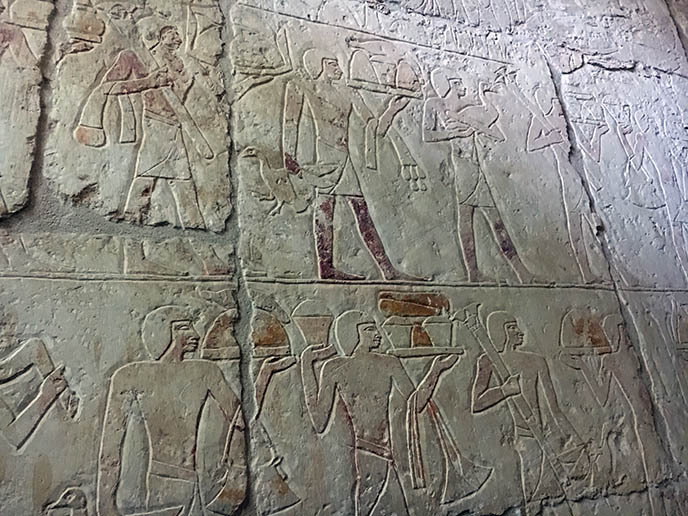 You can tell I’m stunned by this powerful sight: the triad of Menkaure, Khafre, and Khufu. 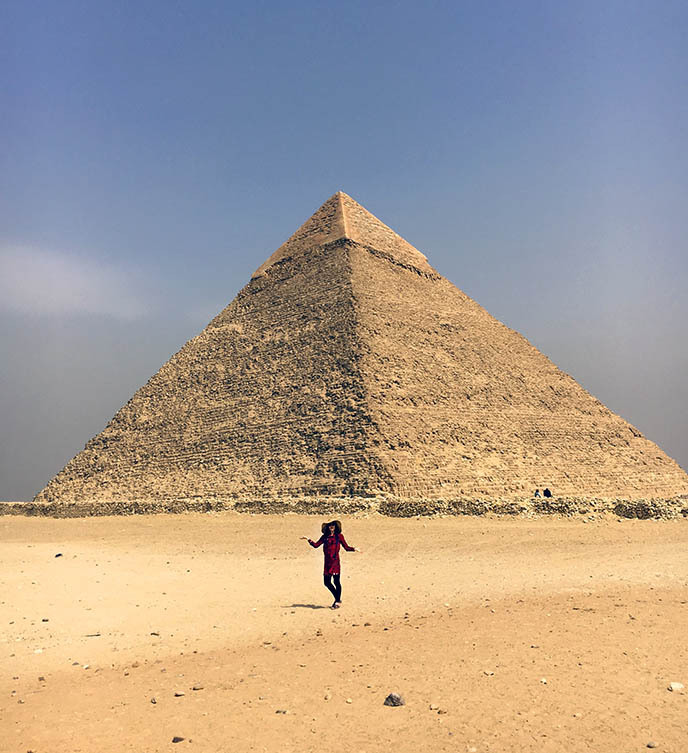 Even Yukiro looks small beneath the Great Pyramid of Giza. 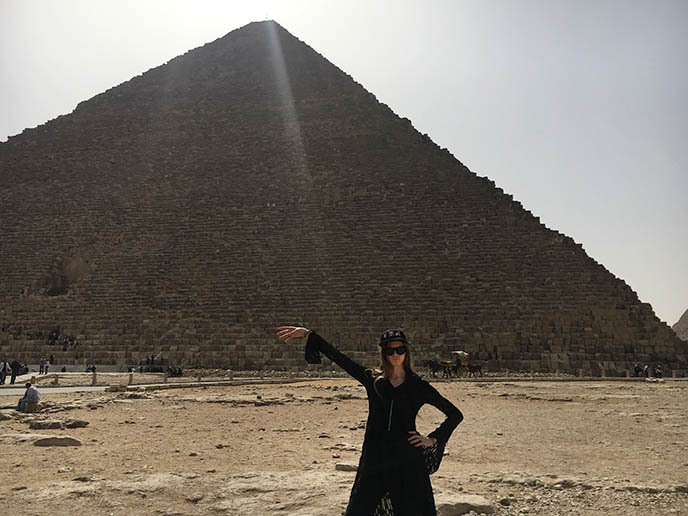 Also known as the Pyramid of Cheops, it’s the largest and oldest of the trio, rising up 148 feet. Why the triangular shape? Some think this represents the sun’s rays, or the primordial mound from which Egyptians believe life originated. To this day, archaeologists aren’t certain how the ancient Egyptians built the Pyramids. 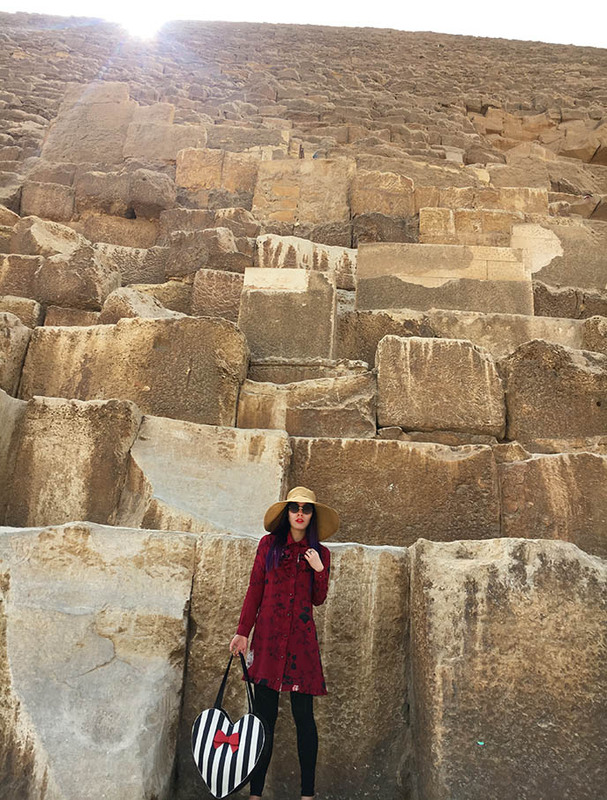 Just look how immense each stone block is compared to me… did the Egyptians have remarkably advanced knowledge, much like the Rapa Nui of Easter Island? Or perhaps aliens gave a helping hand? 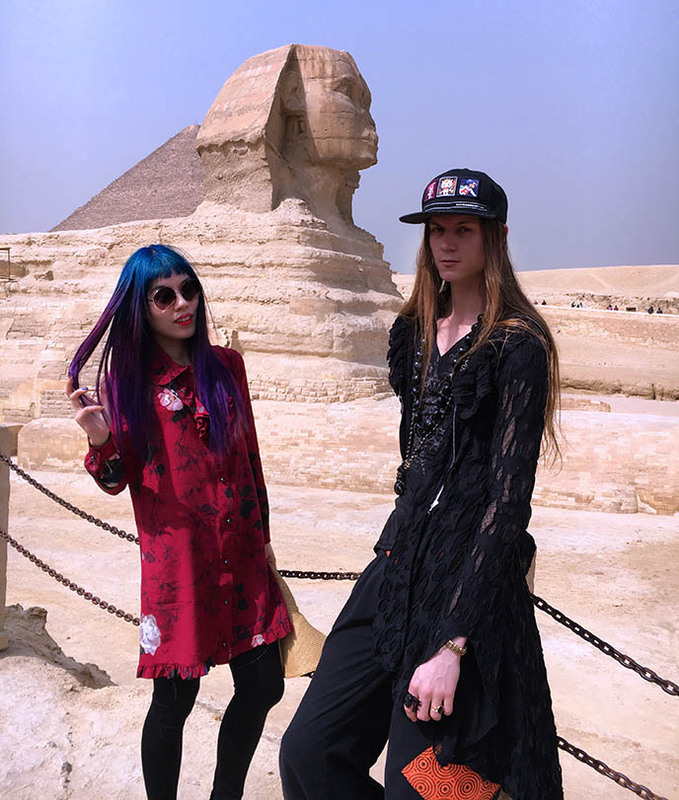 Yukiro and I have globetrotted to many places together, and Egypt ranks among our most epic trips. We got to know our fellow tour-mates over the 12 days; many were from the UK, New Zealand, and Australia, and everyone was around our age. Since I was a child, I’ve been fascinated by ancient Egyptian culture. 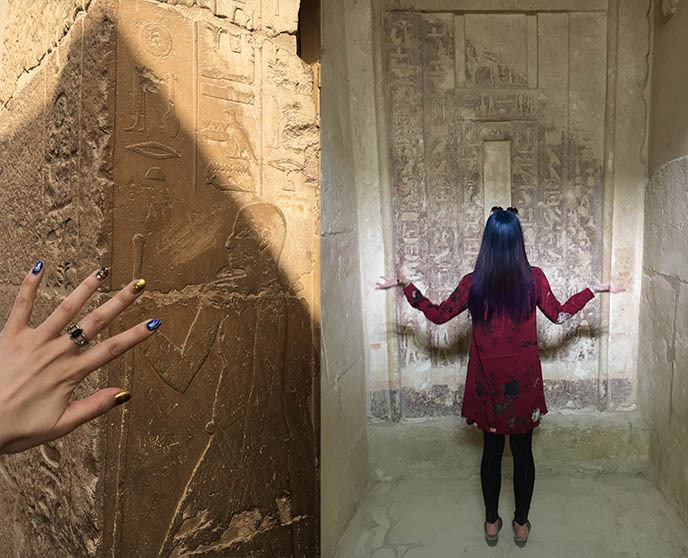 Mummies, devious queens, cat worship, books of the dead… such a mysterious and advanced civilization! We dressed with Egyptian occult flourishes in honor of Anubis, jackel-headed god of the underworld. 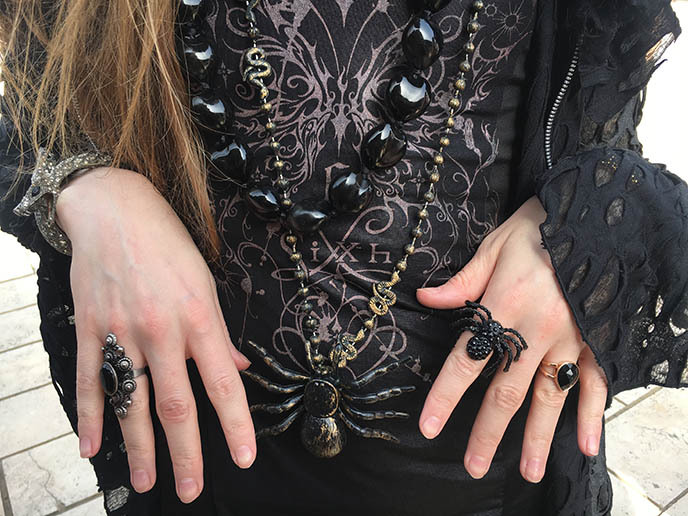 Yukiro displays spider rings and a Goth Sixh top by h.Naoto. 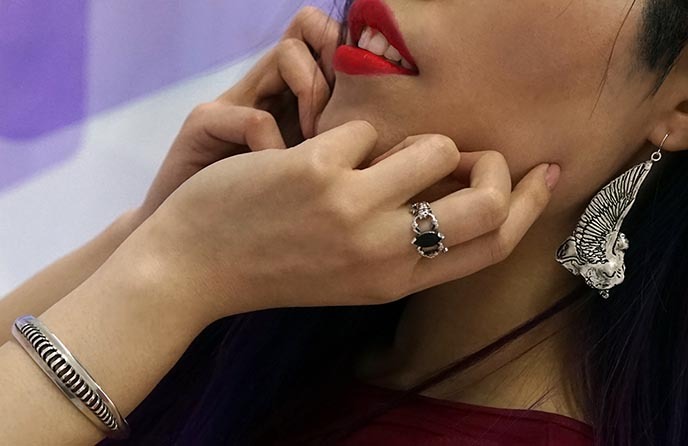 I wore my new Alex Streeter Marquise scorpion ring; his silver design with a black stone is part of his Egyptian jewelry collection. 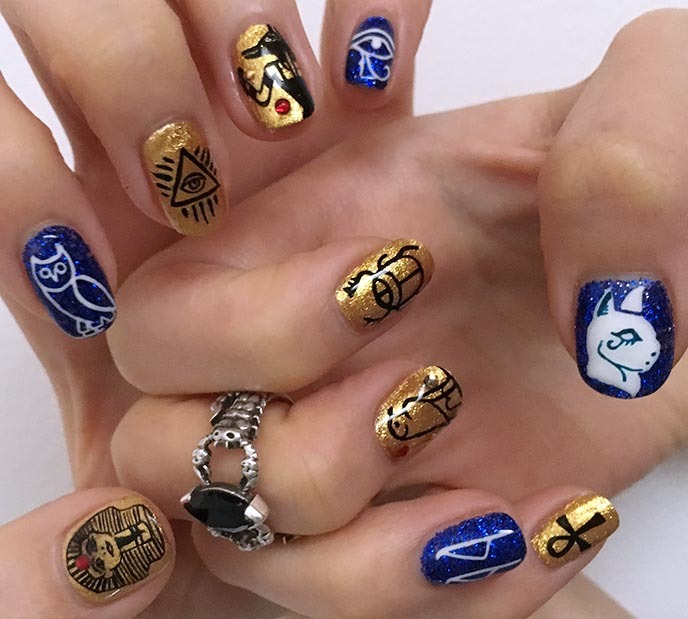 My blue and gold hieroglyph nail art is by Glam Nail Studio. 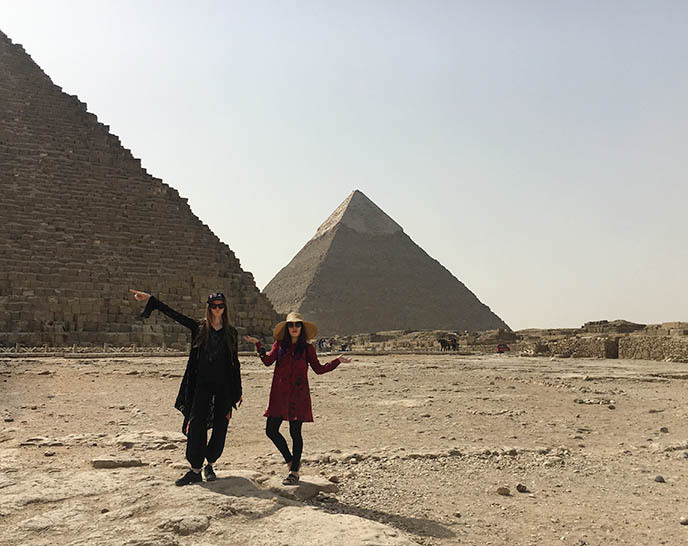 We were in Egypt in late February to March: it’s a great time to go, as the weather is not too hot, and there aren’t many tourists around. It’s best to wear outfits that cover your shoulders and knees; my leggings by Charli Cohen were perfect for the occasion. Of course, I lived in sunglasses and a big hat. My large bag by Lola Ramona was handy for carrying bottles of water and hand sanitizer. 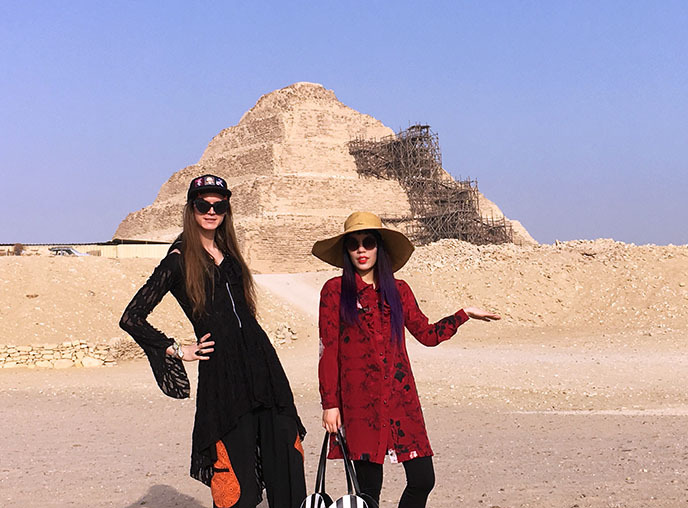 Striking geometric poses in front of the Pyramid of Khafre or Chephren, the second tallest of the three. You can see remains of the original Tura limestone casing at the tip of the triangle. Close up on my Marquise scorpion ring by Alex Streeter Jewelry, and Egyptian symbols gel nails by Glam Nail Studio. 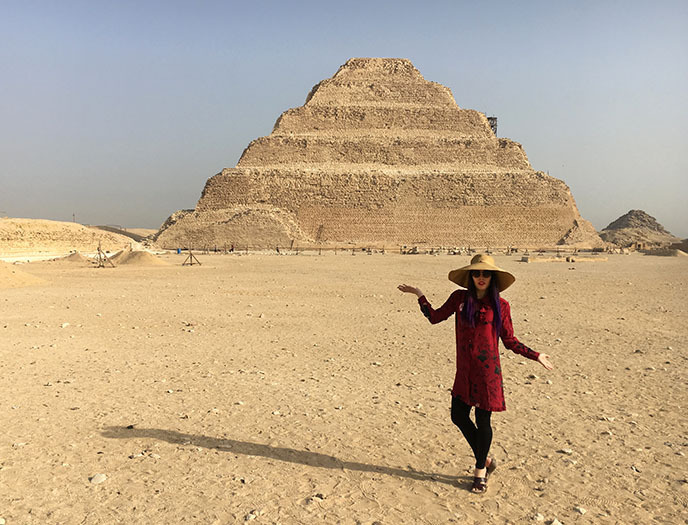 While the Giza pyramids tend to overshadow it, I was impressed by the step pyramid of Djoser. It dates back to the 27th century BCE, and stands 60 meters high. Imhotep, the Pharoah’s vizier, was the architect behind this stepped structure. 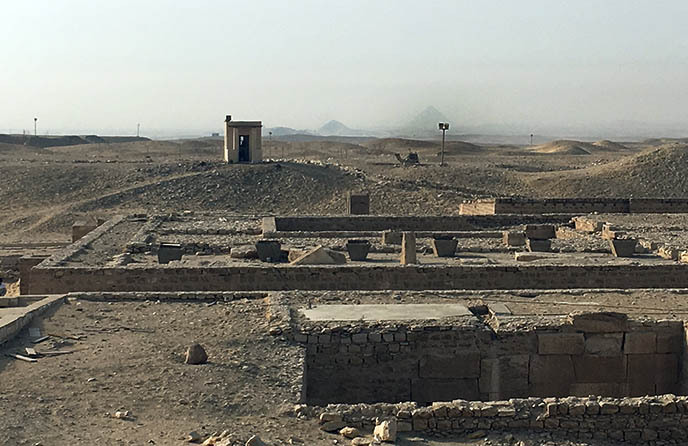 The pyramid stands in the necropolis of Saqqara. 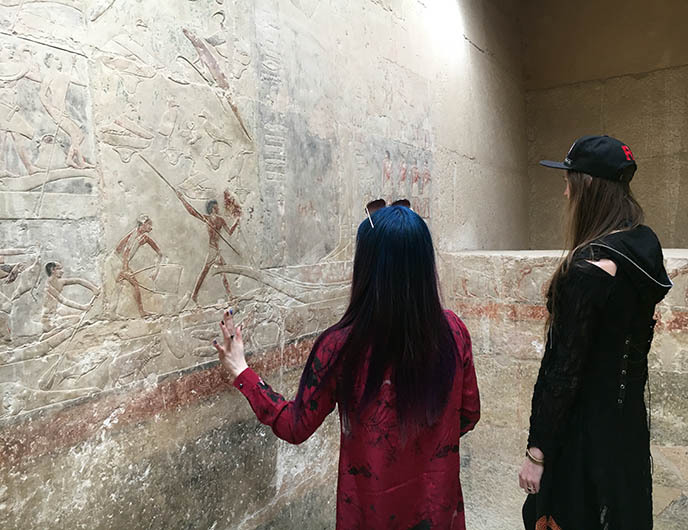 We loved wandering around and popping into the tombs of other kings and wives, which are covered in impressive hieroglyphic carvings. Imhotep’s architecture draws upon light, shadow and shapes for maximum drama. 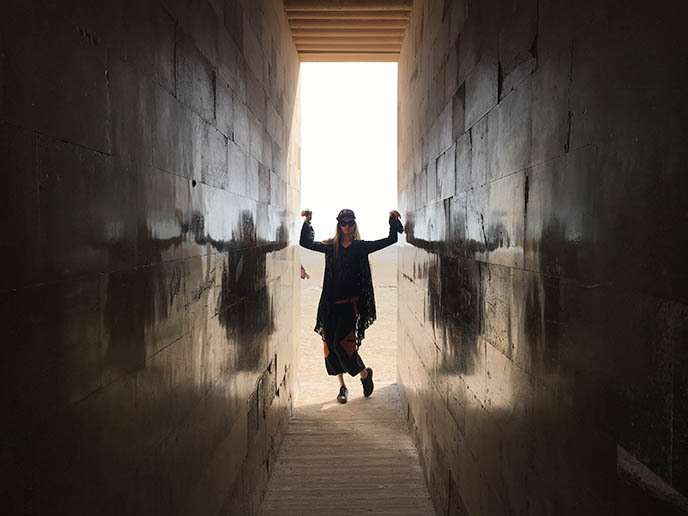 Our Travel Talks guide took us to see the excavations at Sakkara, including a deep trench. In the distance, you can see the points of Cairo’s pyramids. Goths tend to be quite fond of Egyptian culture, perhaps because of our shared interest in death rituals. The pyramids were built to help the king ascend to eternal life. And the Egyptians mummified both humans and animals, using techniques that we still cannot replicate today. The video game “Assassin’s Creed” has a Tombs in Saqqara quest, which is rather accurate to creeping around in real life. The various burial chambers are decorated with wall carvings. This one shows servants bringing offerings to the deceased (boy, those giant cupcakes look delicious). 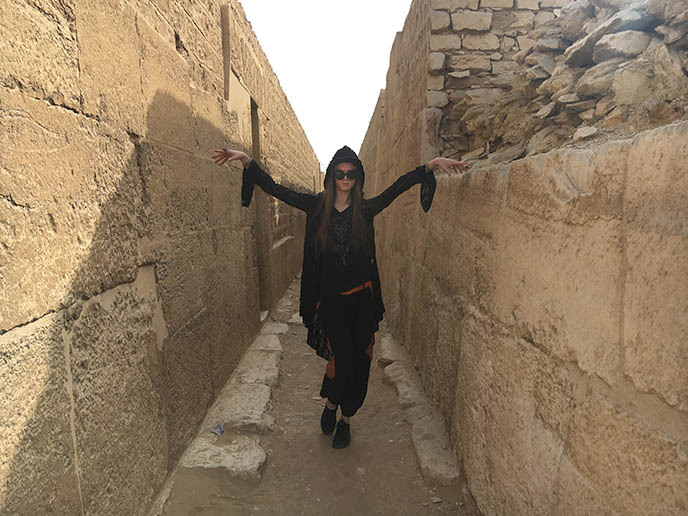 Feeling like Lara Croft – Tomb Raider as I explored these ancient passageways of the dead. 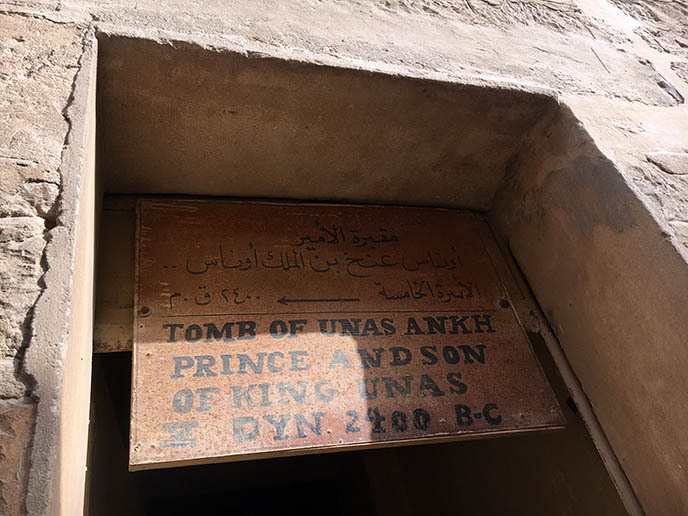 The Tomb of Unas Ankh contained three trapdoors to deter tomb raiders. 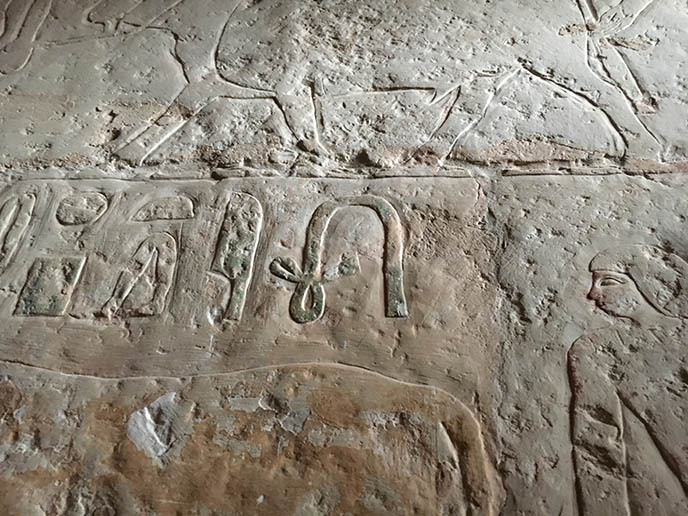 The walls are inscribed with ancient Egyptian texts about life after death. When you’re here in the flesh, you can spot details that you rarely see in textbooks and documentaries: such as this curving ankh! 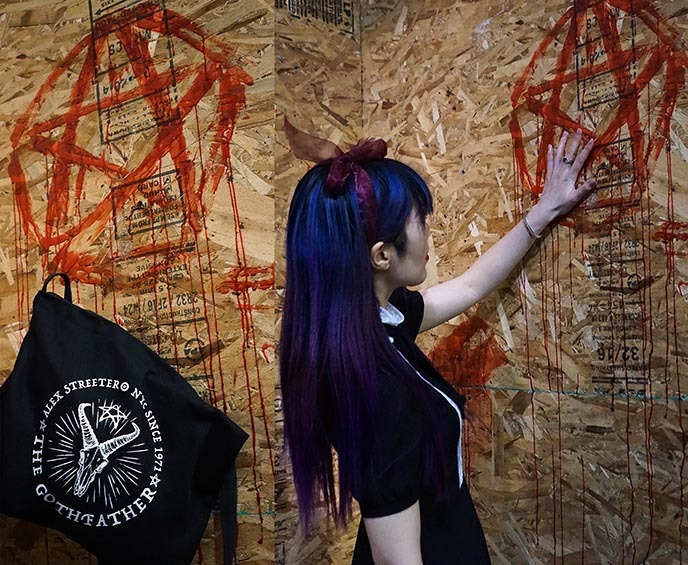 The ankh symbolizes eternal life, and is often found in modern Gothic aesthetics (the character Death in The Sandman comics wore a silver ankh necklace). Our guide pointed out this scene of a doctor attending to his patients: he’s using a scribe to prescribe medications on papyrus! 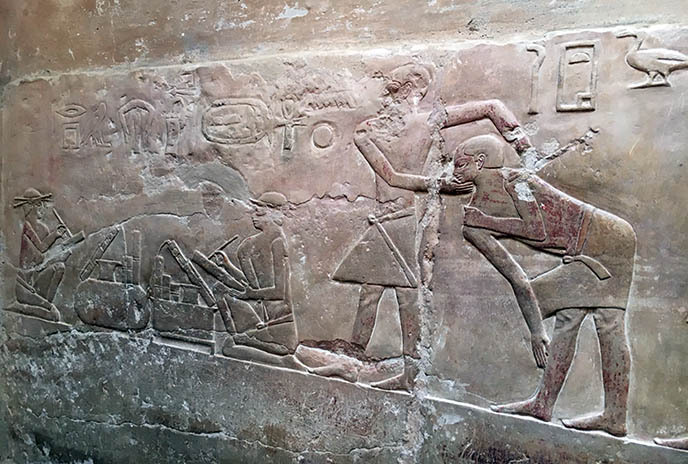 I wonder why the sick are bent over… perhaps they hurt their backs while trying to move the heavy pyramid stones? Other glyphs showed scenes from everyday life, such as hunting, sailing, dancing. Some of the bas-reliefs are still colored with the original pigments. Outside, Yukiro got into a situation that involved a donkey ride… Let’s just say, I took this photo with the man cut in half on purpose! Powering up from the sacred geometry. 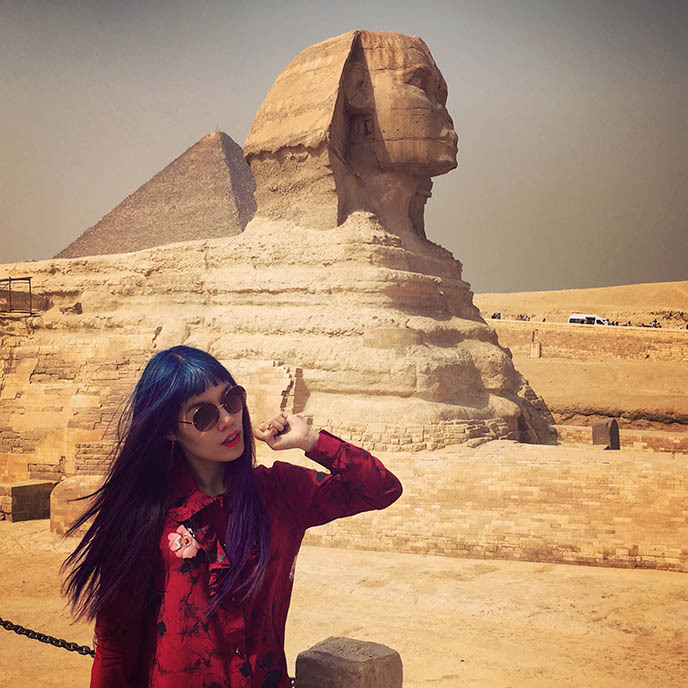 (Yukiro found a number of sand monsters around Djoser’s pyramid, on Pokemon Go). The entrance to mortuary complex looks remarkably modern. 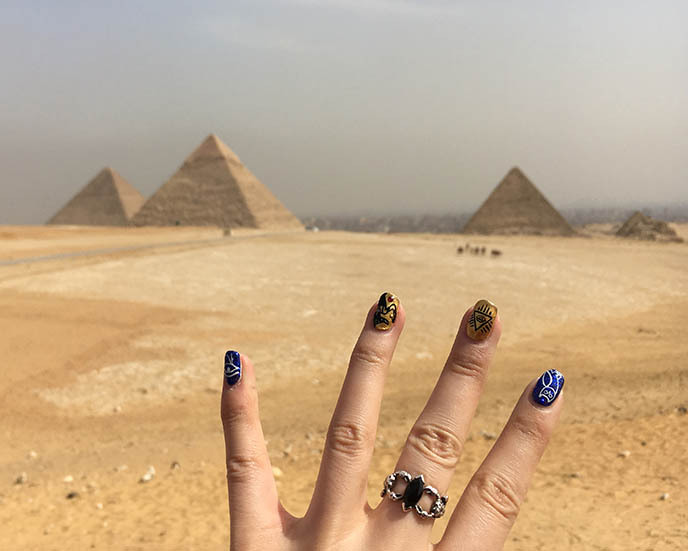 I’m being photobombed by a souvenir vendor… they’re all over Egypt’s landmarks. If they approach you, simply say no and walk on. Inside the narrow doorway, you’ll find these colonnades. Architect Imhotep designed the 20 columns to look like bundles of reeds from the river Nile. 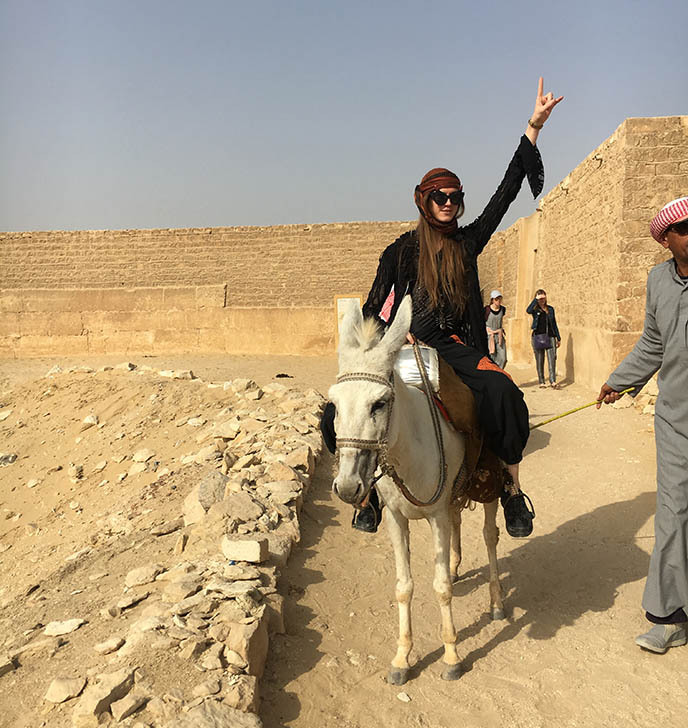 If you enjoyed this dispatch from Cairo, then your jaw will drop when you see what we did next… stay tuned for more from Egypt, as well as France and Lebanon! 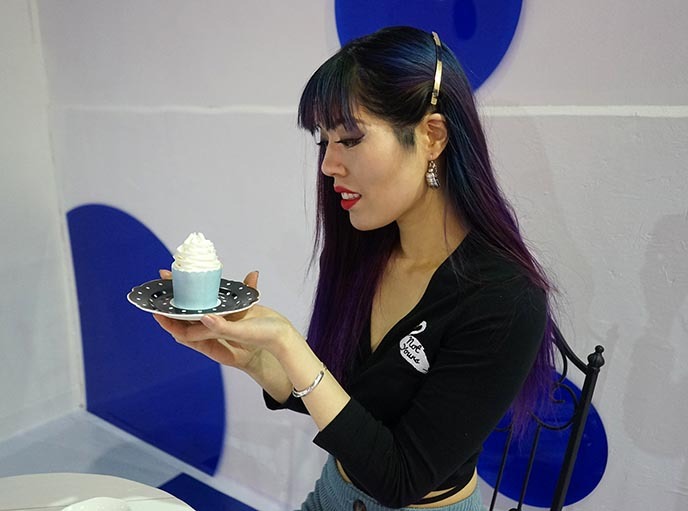 Sugar sugar… Have I stumbled into Candyland? Presenting one last photoshoot before I fly to Paris, Cairo, and Beirut — featuring Charli Cohen’s progressive activewear for the modern super-heroine! As you can imagine, being a travel blogger means I’m always on the go. More than ever, I need a wardrobe that fits with both my lifestyle and alternative aesthetic. 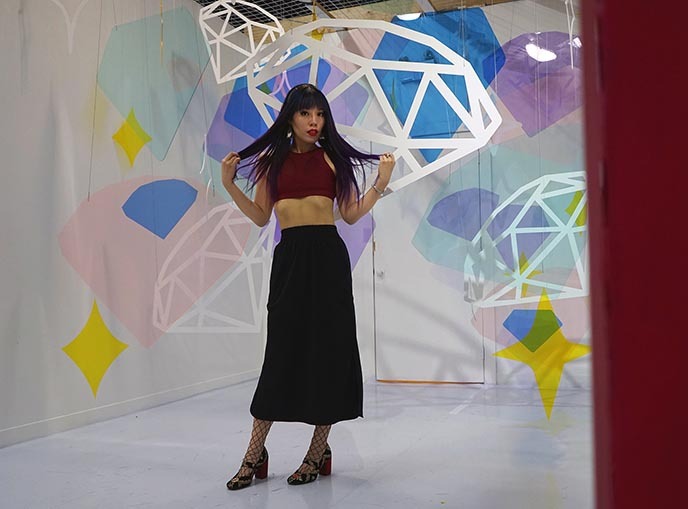 I shot images of her designs at the new Musee du Bonbon in Richmond, BC. This pop-up is designed for taking photos, and the first of its kind in Vancouver. 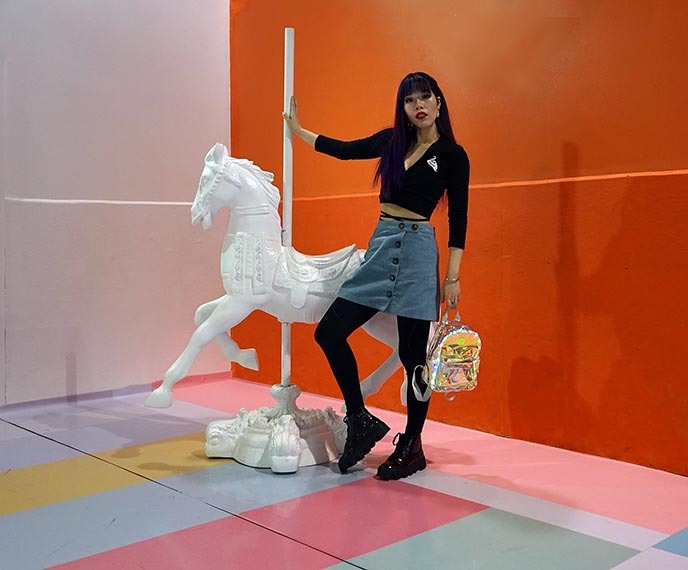 The 3000 square foot space has over 20 creative displays, which are perfect for snapping and sharing on Instagram. 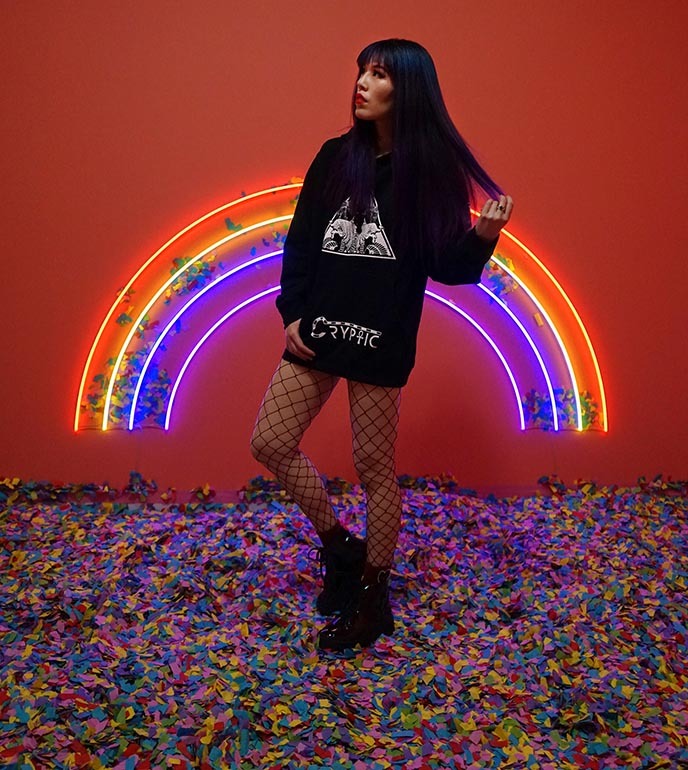 This diamond room was the perfect spot to showcase Charli Cohen. All her garments are beautifully tailored with high-end technical fabrics. 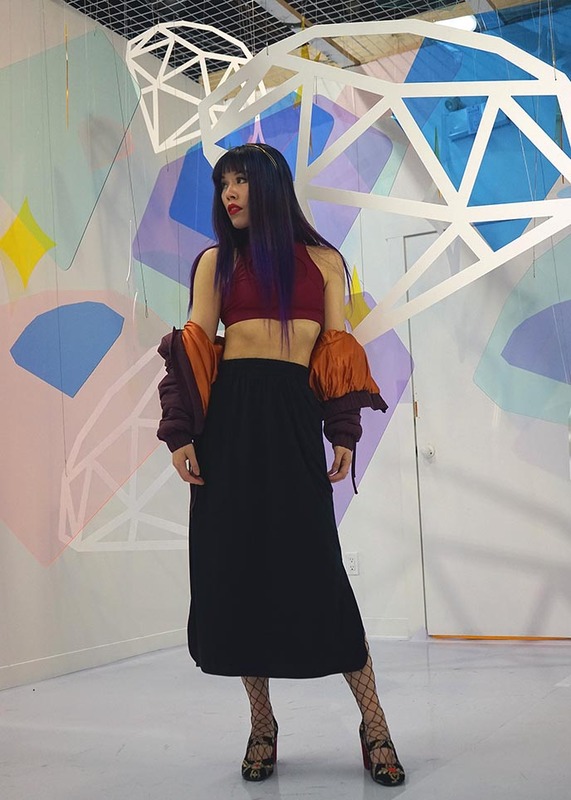 Charli’s designs brilliantly express her passion for futuristic technology, luxury couture, streetwear, and sportswear. I’m 100% behind her evolved approach to fashion, which insists on sustainable materials and production. I’m going to be wrapping myself up in her Trojan Bomber all spring. 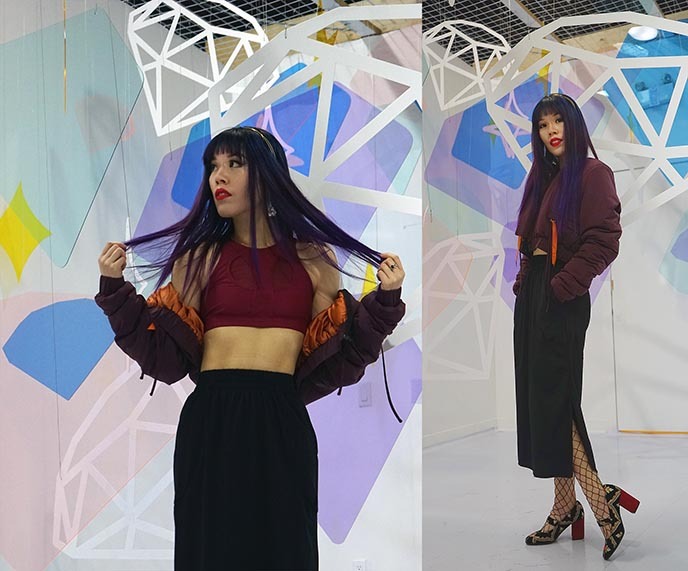 This burgundy cropped jacket is made with the softest technical silk, which is breathable and has Thinsulate climate-control insulation. How adorable is the cropped coat design, with a cinched elastic waist, and zip pockets? I paired my look with Alex Streeter silver jewelry. The Marquise Scorpion ring and Sphinx earrings arrived in time for my trip to Egypt. (The scorpion was a powerful symbol of protection, hailed by the ancient Egyptians). The Radiator Cuff is a space-inspired bracelet by the “New York Goth-father” silversmith. 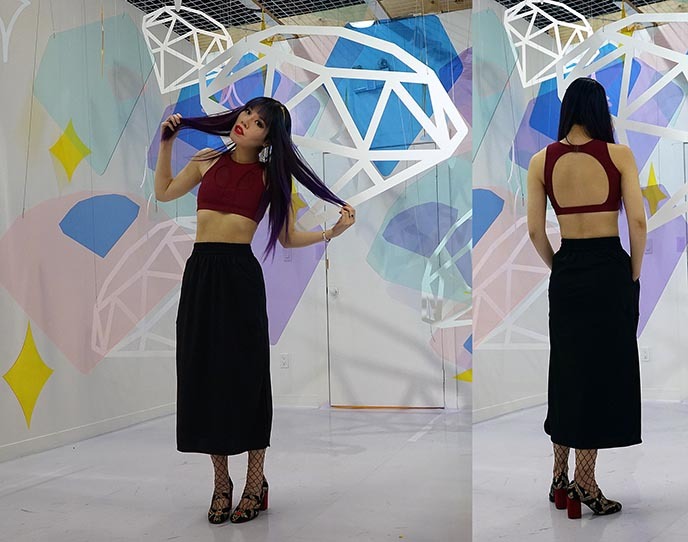 I matched this outfit with strappy red-heeled shoes by Le Babe. Another close-up of my Alex Streeter jewelry. I’m wearing these Silver-Plate Sphinx Earrings, which are intricately acid-edged. 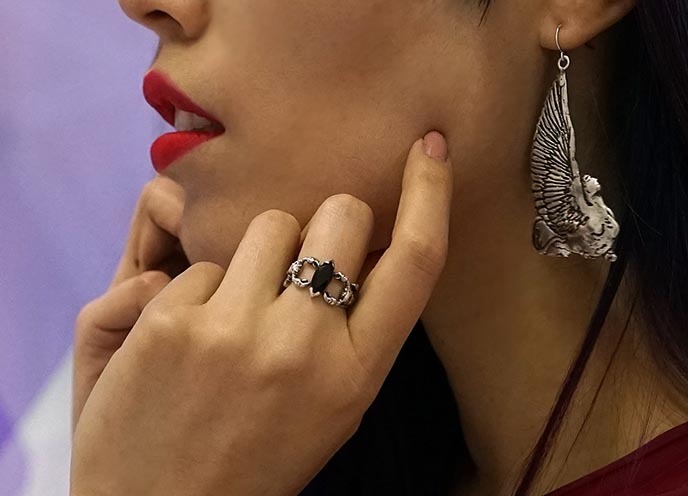 My Alex Streeter ring features a black Marquise-cut stone, held by two mirrored scorpions. 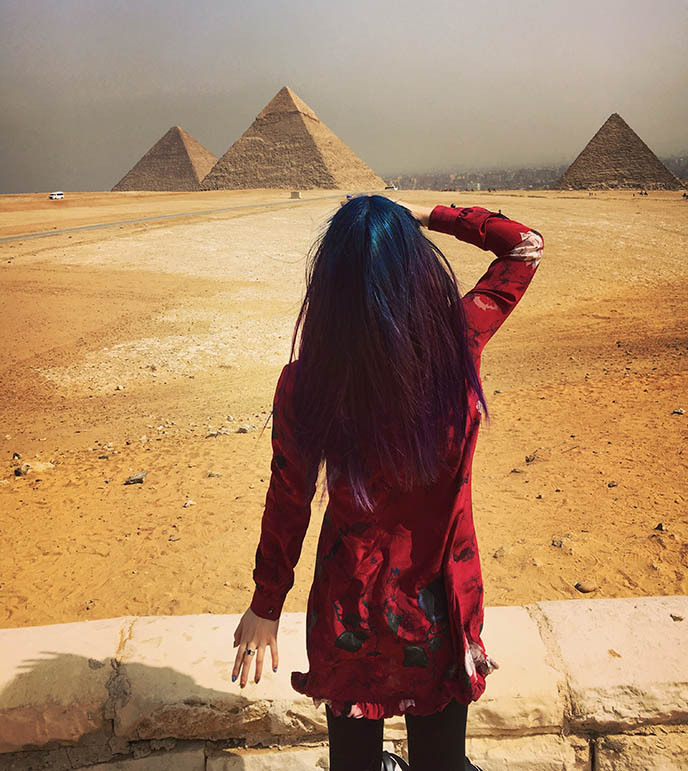 Ancient Egypt is one of Alex’s influences, and I’m honored to wear his designs soon at the Great Pyramids of Giza! Charli Cohen’s red Athena multi crop lives up to its name: it can be worn as a sports bra, edgy top, swimwear, you name it. I’m all about the cut-out back and apocalyptic paneling. It’s easy to put on, with a clasp at the top of the neck. 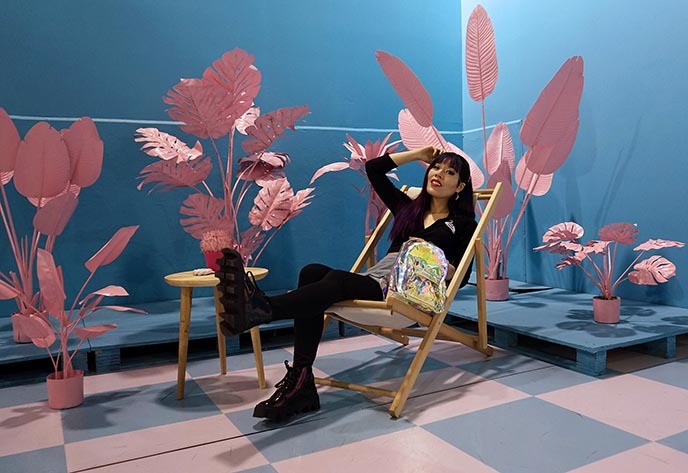 I had fun posing with the various backdrops and props that Musee du Bonbon makes available for their guests. It’s remarkable how the “empty” sets pop once you see them in photos. You can tell I’m a fan of Charli’s zip trackpant. The wide leg and elastic waist are made for dancing, and the vertical white striping makes it stand out. She adds two handy front pockets to the pants, which are made with technical scuba. I’m blown away by Charli Cohen’s luxury fitnesswear. Her alternative designs are unlike anything you’ll find in stores, and they function at the highest performance level. You can find out more on her website and @charlicohen Instagram (she makes clothing for both men and women, and ships worldwide). I hope I’ll soon get a chance to see one of her London Fashion Week shows. Until then, I’ll be “kicking it” in her apparel on my upcoming travels! 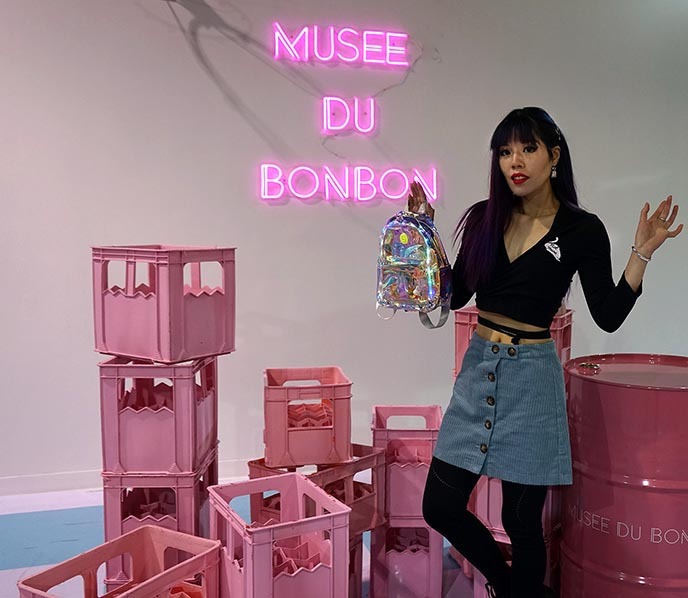 The Musee du Bonbon had a highly Instagrammable rainbow room, featuring a confetti paper pool and large neon arc-en-ciel light. 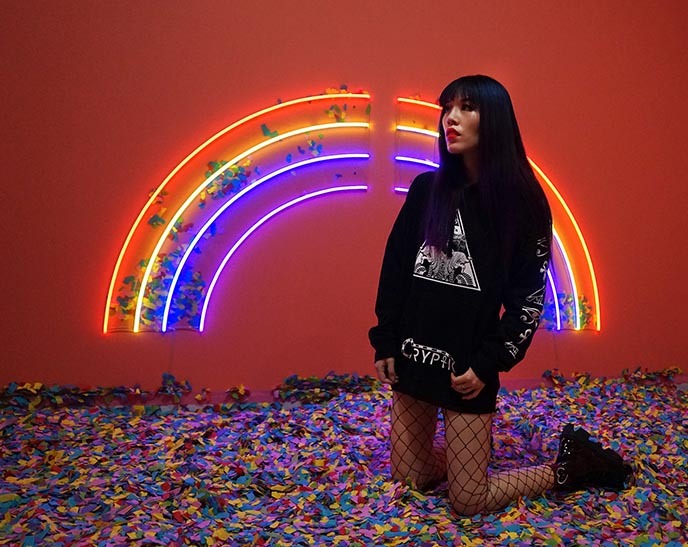 The colorful scene called for a monochrome look, so I wore my Cryptic Apparel Secret Society sweatshirt with a hood. 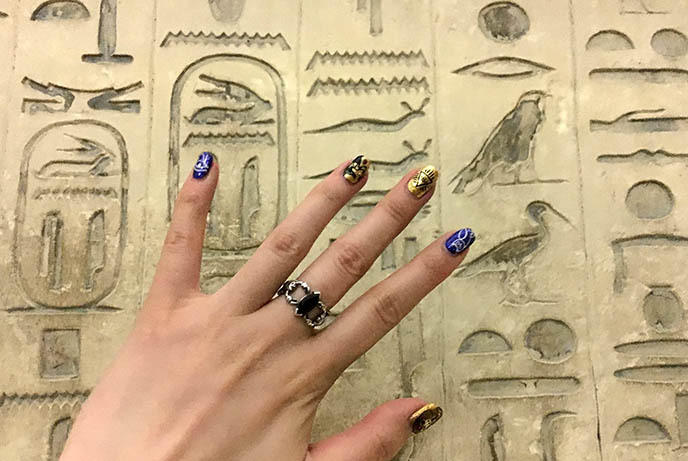 In anticipation of my Egypt journey… Glam Nail Studio dolled up my nails in glittering gold and blue – the colors of King Tut! 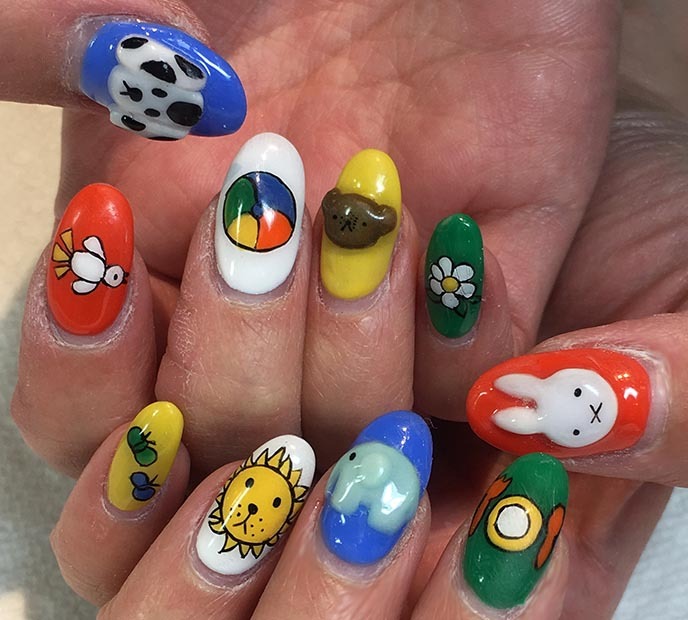 This Japanese nail salon is based in Richmond (Vancouver-area), British Columbia, and they deservedly win top awards for their nail art prowess. 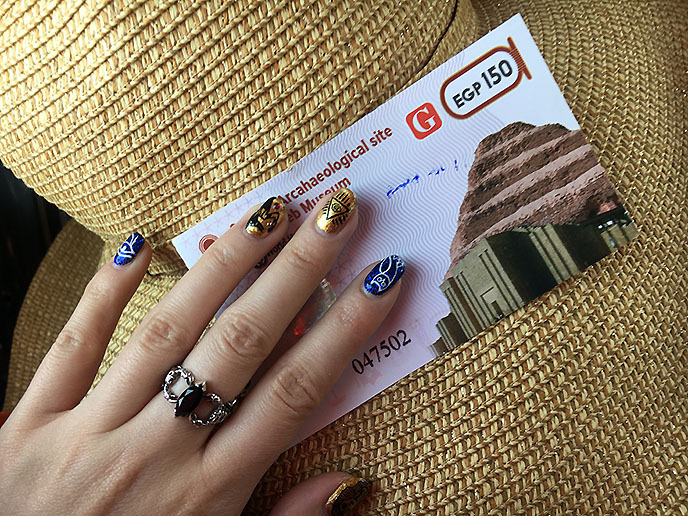 My nail artist drew these designs by freehand, using a tiny brush… look at the lines on Tutankhamen’s sarcophagus! We based the artwork on ancient Egyptian hieroglyphics. Can you spot Horus, Osiris, Bastet, a scarab, and an ankh? Hanging out in a neon-lit rainbow swimming pool… just a typical day. 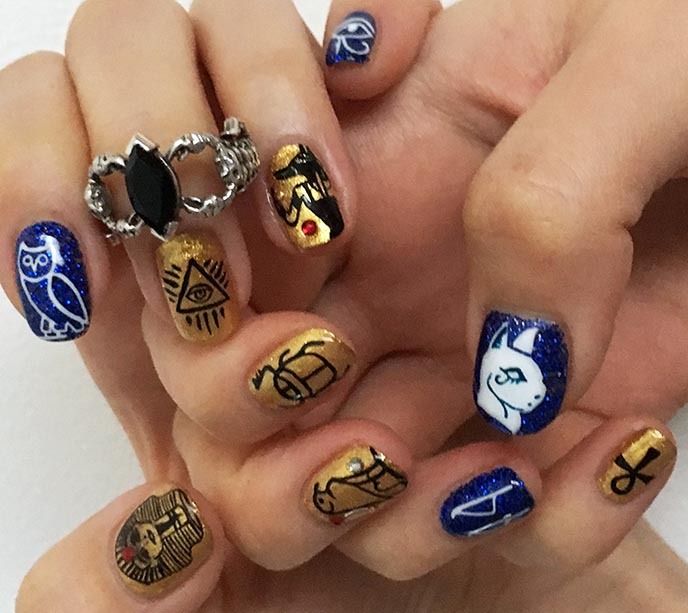 Here’s another example of the jaw-dropping nail art you can get at Glam Nail Studio. (These aren’t my hands, but as a Miffy fanatic, I wish they were!) Check out more Japanese kawaii nail art inspiration on @GlamNailStudio Instagram. 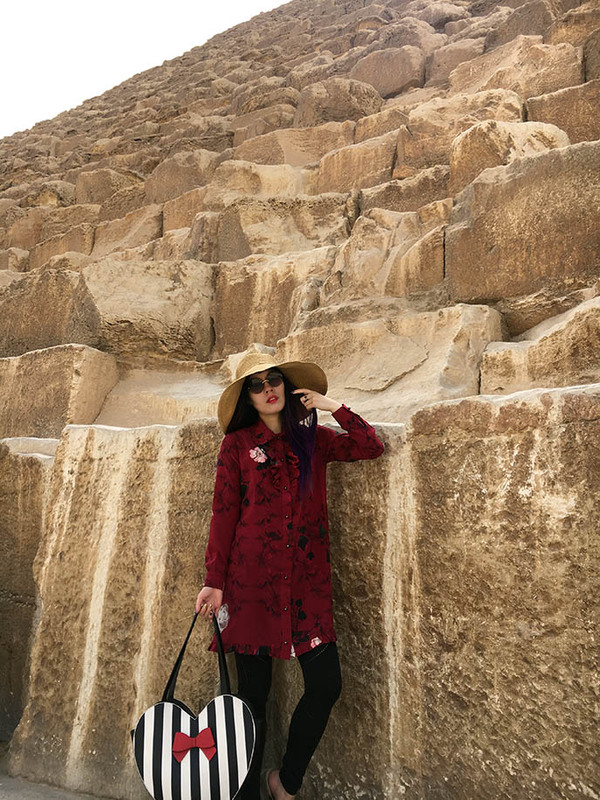 Ready to meet the Sphinx, in my Cryptic Apparel hoodie featuring a pyramid and Egyptian symbols. Love how their designs blend Gothic, street, urban, and ancient history. 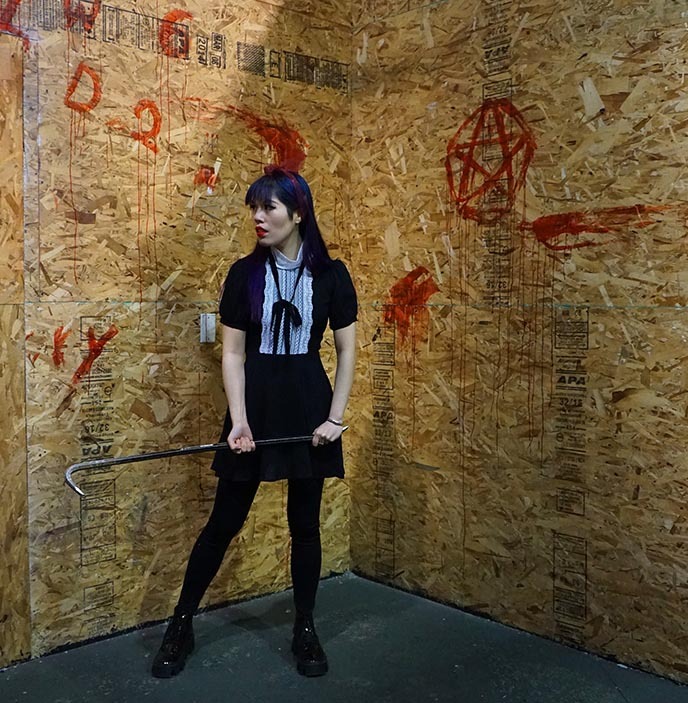 Have you heard of “rage rooms” or “anger rooms”? The concept began in Japan: people pay to release their stress by destroying objects in a safe environment! 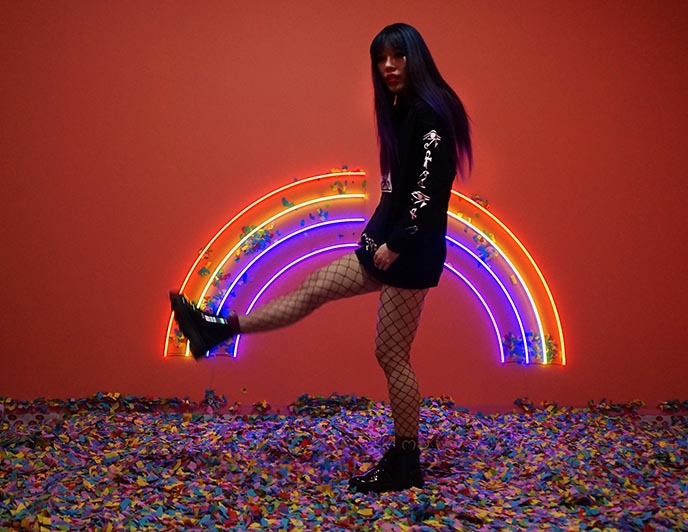 Smash Therapy (situated right next to Musee du Bonbon) is Vancouver’s first anger room. You gear up in protective clothing that makes you look like a survivor of the zombie apocalypse. Then, you pick up a baseball bat or other weapon, and smash objects in the room to your heart’s delight! 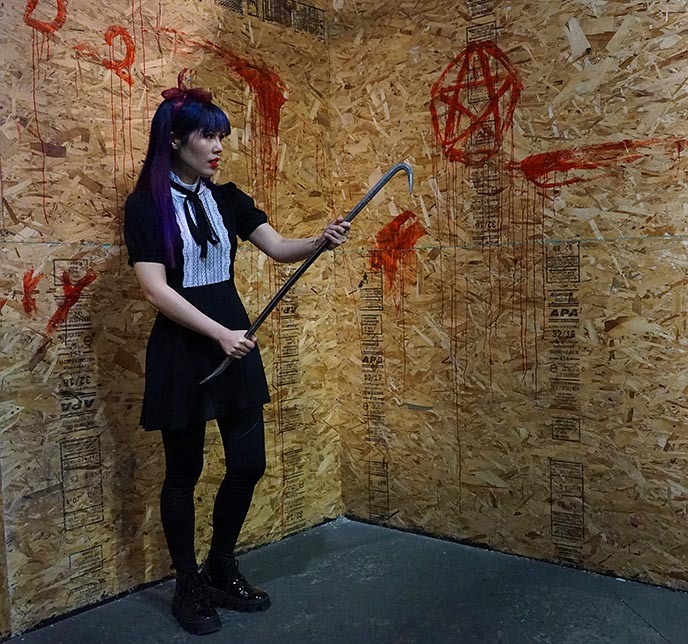 I’m not actually smashing anything here — just posing with a heavy metal hook, which can really do damage to someone! 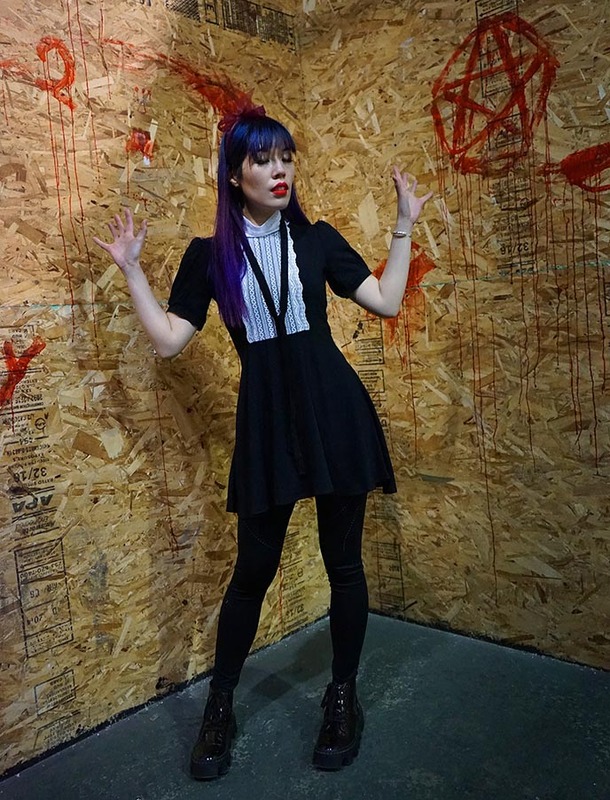 Fittingly, I’m wearing a witchy Goth dress from Forest Ink (it’s by French label Valfre). Forest Ink is an online shop “created for peculiar girls who don’t mind standing out.” (Sounds like anyone you know?) 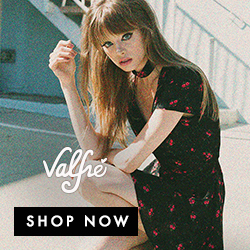 They have the most delectable range of Gothic / cute / grunge clothing, pins, and patches — sourced from indie brands and artists worldwide. My Valfre Jolie black and white dress from Forest Ink reminds me of the Weird Sisters in the Chilling Adventures of Sabrina. This elegant, high-collared dress comes with a black ribbon that can be tied in a variety of ways around the neck. 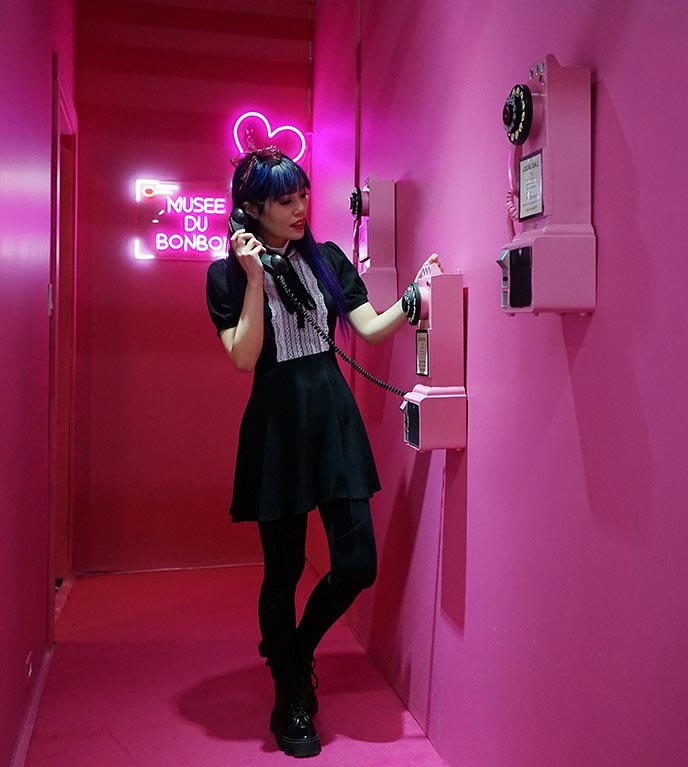 It’s fun how I can play up different sides of myself, in Musee du Bonbon’s various photo rooms. This “Parisian cafe” staged set is getting me in the mood for France. I’m wearing a versatile light blue corduroy skirt, also by Forest Ink. 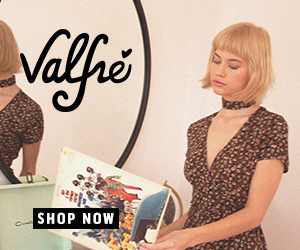 Forest Ink also sent me this delicious Valfre ballerina wrap top, which has ribbon ties that you can loop around your waist. Note the white swan logo on it, and the cheeky words “Not Yours”! My gold minimalist barrette is by Sylvain Le Hen. Here’s the look from head to toe. My light-up backpack is by Cyberdog: the flashing colors mimic the backdrop. It was a joy to get creative and play with photography at Musee du Bonbon. 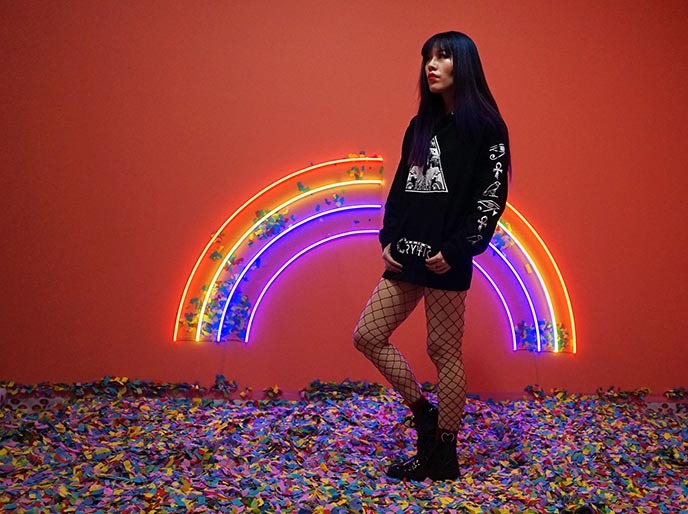 The special photo/art exhibit is open in Vancouver only until March 31, so get a ticket and take pictures before it’s gone. 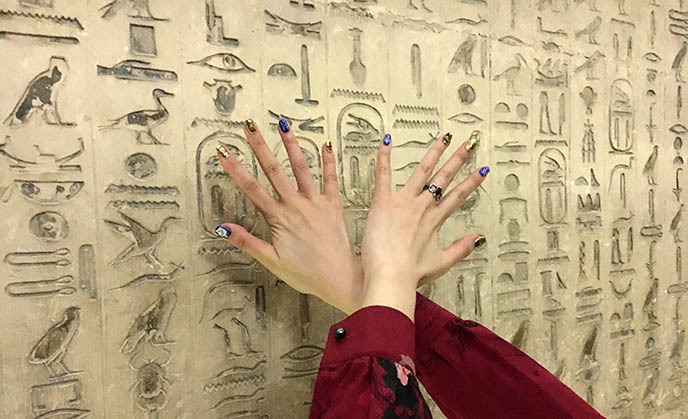 A last look at my scintillating Egyptian nail art bestowed by Glam Nails. Head’s up — it’s going to be quiet on the blog for the next while, as I’ll be off on adventures in Egypt, Beirut, and Paris! 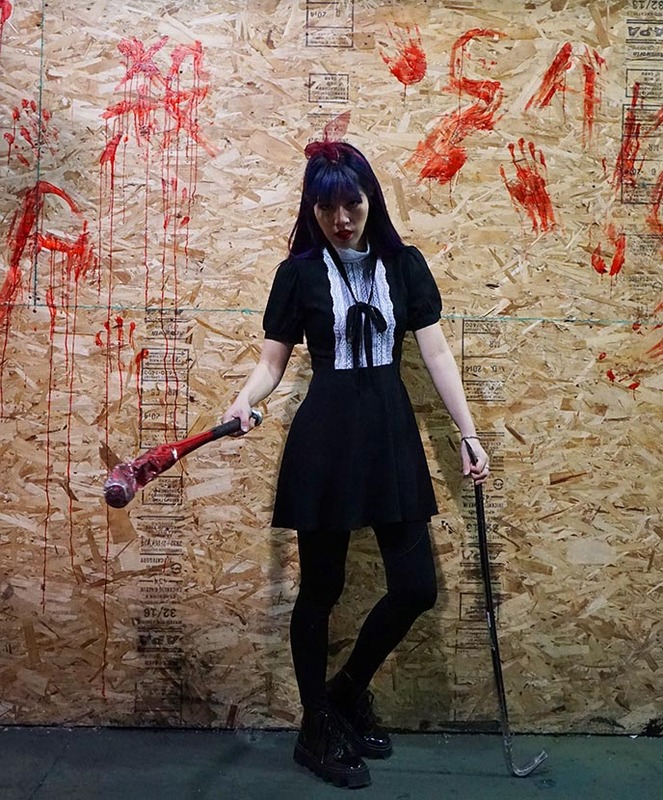 However, I’ll be updating daily on Instagram: add me @lacarmina. 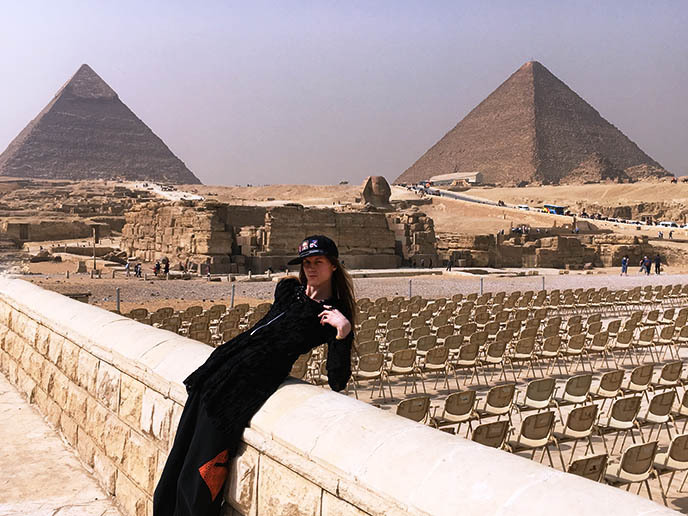 See you over the rainbow… in the land of the Nefertiti, Osiris and the Sphinx!